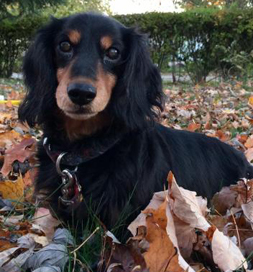 For several weeks, Wendy Jones had been daydreaming over a longhaired Dachshund named Talia, listed on Petfinder by Peace for Paws Ohio. Talia still looks like a puppy. He agreed, and this time, “I asked people where her shelter group was. Someone pointed me to the right people, and I asked one of the volunteers if she knew anything about Talia.” The woman didn’t recognize the name but did remember that one of the volunteers was fostering a blind dog. Wendy made contact and emailed back and forth. The shelter did a background check, and then the foster person brought the dog for a home visit. When Wendy asked how long the adoption was going to take, the woman asked how soon Wendy would like to have her. “Now!” Wendy replied. The woman had her sign the papers, and the adoption was finalized right then. Nowadays, Wendy and Talia are almost inseparable. The dog loves to sit on Wendy’s lap and, “even though she is blind and older, she still loves to play with her squeaky toys until she ‘kills’ them,” Wendy says. “When I open the refrigerator door she stands there as if she is looking for something to eat. If I ask her if she wants to go for a ride, she will go stand beside the door.” Her blindness doesn’t hold her back. Wendy counts Talia as a blessing in her life, and surely Wendy is that for Talia as well.